This useful construction video shows the detailed process for two-tiered retaining wall design and installation. It belongs to Versalok retaining wall block, containing Willow Creek pavers for the sidewalk. The project is completed in 3 days. The project consists of 8 tons of class 5 base, 12 pallets of block (about 15 tons worth), three pallets of pavers (4 tons or so), 6 tons of rock backfill for the walls, sod, and mulch. 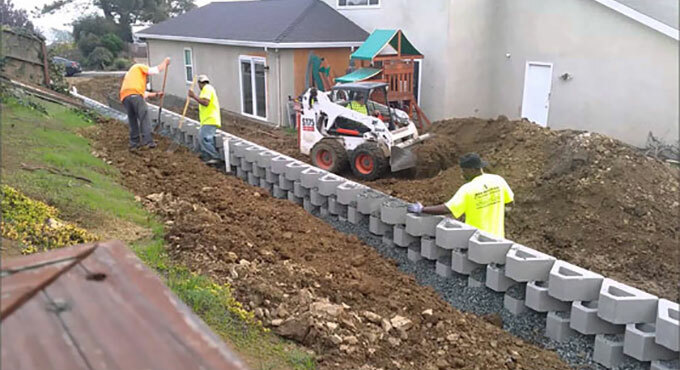 This construction video will help you to plan, design and construct the exact retaining wall. The most crucial factor in perfect design and installation of retaining walls is to identify and resist the proneness of the retained material to go downslope because of gravity. This produces lateral earth pressure behind the wall on the basis of the angle of internal friction (phi) and the cohesive strength (c) of the retained material, in addition to the direction and magnitude of movement the retaining structure encounters.